Colin Murray meets international rugby referee Nigel Owens, and talks about growing up in Wales, coming to terms with his sexuality, and refereeing at the Rugby World Cup. 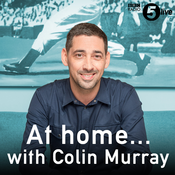 Colin Murray meets Kriss Akabusi at his home, and talks about his life growing up in a children’s home, his career in the army, to becoming an Olympic medallist on the track. Colin gets a visit from The Secret Footballer, the anonymous purported Premier League footballer who lifts the lid on what actually happens in the dressing room and within the confines of the corridors of football, and what life is really like off the pitch for a professional player. Colin Murray meets darts legend Bobby George to talk about how he built his house, how he got into darts at the age of 30, and the unexpected darts fans he’s met in his career. Colin Murray meets 11 time Paralympic gold medallist Baroness Tanni Grey-Thompson to talk athletics, helmet hair, first celebrity crush and how Tanni isn’t even her real name!